Public announcements on the estimate of the size of the crowd in the February 29 has been varied. From a low of 15,000 from the PNP to a high of 80,000 from the organizers, the polarization of society seems to have spilled over to the estimates of the number of those who came last Friday. The politics of the numbers of a mobilization is obvious, as one story lead in the newspaper clearly put it: “The crowd is the statement”. Every time a sizeable mobilization has been conducted, whether in Mendiola, Ayala or Edsa, conflicting estimates are issued that either downplay or magnify the data. Is there some way to effectively quantify the size of the crowd in a mobilization? The most common and practicable way is to measure the area covered by the protest and measure, according to some density estimate, the number of those who attended. This estimation is most easily done with overhead shots and areal surveys. It would tend to have a bias against those who are under some shelter or inside a building but it would give a rough estimate on the size of the crowd. Other methods could include real time computer tracking, visual count and even extrapolation from the amount of artifacts left by the crowd. It is also common practice for the organizers to have reports of attendance on how many they have mobilized for the event on which they empirically base their estimates. Crowd density estimates stem from the fact that people usually occupy around a quarter of a square meter in a very crowded space. This translates to around four (4) persons in a square meter. Lower crowd density means a larger space between each person. We should note that crowd density is usually not uniform, except in very crowded areas, and will taper off from the central hub of activity in the mobilization. In the February 29 mobilization, we divide the mobilization into 5 major areas. 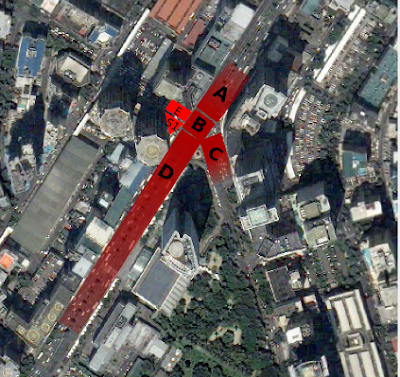 Section A is the area of Ayala going towards Herrera. 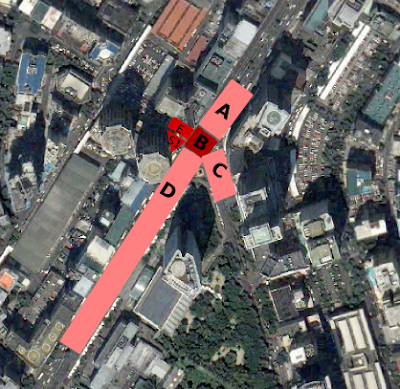 Section B is the central area of the intersection, section C is along Paseo de Roxas facing the stage, section D is the side of Ayala towards Makati Avenue/EDSA and section E is the area behind the stage. Additional side areas such as the corner underneath HSBC building is designated S1 and other corners are collectively called S2. Note that sidewalks and other establishments are not included in this estimation. The table above summarizes the area and the crowd estimate depending on people density. along area A, C and D. It was difficult to move within the central area as it remained packed even until the end of the program. In this light, we would be using 4 per square meter in B. Area E and S1 are similarly near the stage and thus have a higher density that the rest. For both, we would use 3 per square meter crowd density. As the rally started around 5 pm, not all who came were already there. Due to delays from checkpoints and police barricades such as what happened to the UP students and professors in Philcoa, many still were coming even after the program's start. With others still coming in, as well as some already leaving, the crowd size relatively remained the same after early evening. With this we should account for the “replacement” crowd that came in after the rally began. Makati employees and other groups replaced those who left early in the program. We shall use a “replacement” factor of 20% to include those who came in late as well as those who were not counted by the estimation (in the establishments, on the sidewalks, etc). Using the area for each section, the most likely density for each and the replacement factor, we arrive at the most likely estimate of the crowd size at approximately 50,300. At minimum density of one per square meter, the minimum is still above the one quoted by the PNP: 19,000 vs. the PNP's 15,000. High estimates would range from 60,000 to 70,000, not far from the peak quoted by the opposition. The theoretical maximum, at 4 per square meter, that the area can hold is 89,000 persons. This estimate is based on a uniform distribution of people in each section. We need to considering further that crowd densities does not change abruptly. We therefore introduce a tapering estimate using a Gamma distribution for the crowd density. This is based on the observation that from a high of 4 per square meter at the center (the density at the area B), the crowd density will taper off gradually within the area considered as yo go far away from the center. This tapering model will account for the higher density in the front of the column than in the back. We apply this to sections A, C, and D.
We used images from Google Earth as well as its software to model and measure the size of the streets. Perspective view was also employed to estimate correctly the area covered by the mobilization. The photos and the screenshot from Google Earth is presented in the last table below. In summary, the crowd size during the February 29 Interfaith Rally is most likely 50-57,000 with a possible high of around 70,000. The police estimates of 15,000 are a far understimation of the size of the crowd since even at low densities, the number will still be around 19,000. The estimation is based on several shots of the crowd from different vantage points as well as screen grabs from different footages of the assembly. The lack of an aerial shot due to the no-fly zone order makes it difficult to have an simultaneous estimate of the crowd size at a particular time from an overhead point of view. We thus have to rely on photos from the buildings around the area.